A Focus Group Discussion (or FGD) is a qualitative research method in the social sciences, with a particular emphasis and application in the developmental program evaluation sphere. FGDs are a predetermined semi-structured interview led by a skilled moderator. The moderator asks broad questions to elicit responses and generate discussion among the participants. The moderator’s goal is to generate the maximum amount of discussion and opinions within a given time period. Conducting an impact assessment survey? Get started already with this ready-to-use survey template designed by experts. When Should You Use a Focus Group Discussion? Focus Group Discussions should be used when you need to understand an issue at a deeper level than you can access with a survey. They are helpful for adding meaning and understanding to existing knowledge, or getting at the “why” and “how” of a topic. A survey would be a good way to learn that 54% of the population prefers Program A. However, a FGD is a good way to learn why 54% of the population prefers Program A. It is important to take time to carefully plan your questions. 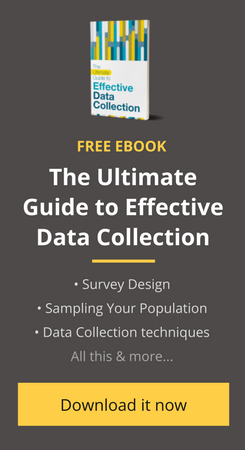 Poorly-worded, biased, or awkward questions can derail a FGD and spoil the quality of your data. Keep the number of questions reasonable (under 10, if possible). This prevents the participants from getting confused or worn out by a long discussion. Keep the questions simple and short. FGD participants won’t get the chance to see the questions like in a survey. Ensure that the wording on questions is clear. Otherwise, participants will end up discussing the question itself, rather than what the question was trying to ask. Be careful that questions about sensitive issues or topics are asked carefully. Otherwise, the FGD will stop just because people are too embarrassed to answer. Make sure that questions are worded in a way that cannot be answered with a simple “Yes” or “No” answer. Using words like “Why” and “How” will help elicit better responses from participants. How familiar are you with our programs? How often do you attend our programs? What are your favorite and least favorite aspects of Program A? What are your favorite and least favorite aspects of Program B? What influences whether you attend a program? What influences whether your friends attend a program? If we were to close a program, which one should we close and why? Is there anything else you’d like to say about our programs? An FGD should be between 60 and 90 minutes. If the FGD is shorter than 60 minutes, it is often difficult to fully explore the discussion topic. If the FGD is longer than 90 minutes, the discussion can become unproductive (as participants get weary) and the discussion can start to impose on participants’ time. Focus Group Discussion involves two to eight people on average. Greater than eight participants becomes crowd for a FGD and is more suited for an Advisory Board. Creating homogeneity in the FGD group can help participants feel more comfortable expressing their opinions. Finding this article useful? Share it with your friends! Gender: Will men and women feel comfortable discussing this topic in a mixed-gender group? For example, women might feel uncomfortable discussing maternal health if men are in the group. Age: Will age affect the way that people react to this topic? For example, a young person might feel uncomfortable talking about his drinking habits if older people from his community are in the room. Hierarchy: Will people of different hierarchical positions be able to discuss this topic equally? For example, a student might feel uncomfortable discussing her teachers if the school principal is in the FGD. Certain criteria should be set up front and used to screen potential FGD participants. Make sure the participants have provided informed consent verbally or ideally on a written form, in line with research ethics best practices. Be sure to make the location and time of the FGD clear to all participants. If you anticipate some participants not showing up, invite 10-20% extra participants. However, be careful to not create too large of a group. Be sure that the FGD is in a public place that is convenient for participants. Consider the location’s proximity to public transportation. If the FGD must happen out in the field, make it as comfortable and convenient for participants as possible. Make sure that the setting does not bias the information being collected. If it is important to collect demographic data from participants (like age, gender, caste, etc), design a short form that takes no more than 2 or 3 minutes to complete. The form can be administered before the focus group starts. Remain neutral to ensure that everyone feels comfortable expressing their opinion. No nodding or shaking your head, raising eyebrows, agreeing or disagreeing with comments, or praising or denigrating participants. Deal with dominant participants by acknowledging their opinion and soliciting other opinions. Sentences like “Thank you. What do other people think?” can be helpful. Paraphrase or summarize long, unclear comments by participants. This shows participants that the moderator is actively listening, and it helps the moderator to ensure he or she has understood the participant’s statement. Act spontaneously if needed. If the conversation goes in an unexpected, but productive direction, go with it and ask questions that were not on the initial questionnaire. Probe deeper into new topics and ideas, as long as the information being gained is valuable. Use a good audio or video recorder. Your smart phone audio recorder works well if the phone has good battery life. Transcribe the FGD as soon as the conversation is completed, so the nuances of the dialogue are not lost in the annals of time. The facilitator should take notes in the midst of the dialogue and after the episode with the participants. Reflective notes make for robust qualitative data. Ideally pay a participation fee to the FGD participants as they might skip productive work to participate in the study. Make arrangements for refreshments too. It is important to realize that there are several limitations to FGDs. First, since FGD data is qualitative, it cannot necessarily be generalizable to the population. This is because qualitative data is often context specific. Second, facilitators must ensure that their bias is not evident. Otherwise, it will veer the trajectory of the conversation. They must be also be active in ensuring that active participants do not overpower subdued participants during the discussion. Don’t rely on paper for taking notes during your next focus group discussion. Start collecting high-quality data using low-cost mobiles with Collect, our mobile data collection app. Start your free trial now! This blog was co-authored by Monishankar Prasad and Christine Garcia. Note: This article was originally published on 15 September 2015, then refreshed and updated on 11 September 2017. This is a great eye opener. I’ve benefited a great deal. Hi! I will be using Focus group Discussion for my thesis. Does the guide questions to be used in the discussion needs to be validated? what validation and reliability test to use? I will be very thankful for your responses. Thank you much,it’s such an educative information to me.Base for understanding FGD. Thanks for nicely sharing about FGD. Thank you for this article. Very informative and helpful. Thank you, it was effectively increased my knowledge on FGD. This is very important sessions, especilalay during conducting baseline and endline assessments. And I appreciate for your sharing on this. It id a good idea . Very helpful, interesting and inspiring. Feel much apt after reading through this paper. Looking forward for details on other qualitative methods in research. thank you very much, it’s so much worthy for me. what type of analysis should we use inorder to analyse the FGD data? It is a wonderful read…….precise yet comprehensive for beginners in the field. It has really influenced and triggered my aspirations as i have now gotten a commence point,which I believe I’ll be able to do a worthwhile work which am yet to start very soon.Thanks for your inputs. This will help me a lot in conducting my thesis. Very helpful!!! its awesome. Its very helpful. It clear up all my doubts. Thank you so much Teacher. what is differences and similarities between focus group discussion and interview techniques? Hi Sunday! The big difference is in who is involved. An FGD generally has one interviewer and many people being interviewed. An interview generally has one interviewer and one person being interviewed. Here’s more information about both FGDs and interviews: https://blog.socialcops.com/academy/resources/3-qualitative-research-methods/. Hope that helps! What would be the best approach in analysis of FGD findings? ? What an eye opener! Thank you. Very informative,I am currently using the tips to conduct an FGD for my Research topic. Thanks alot it was very usefull for me. Very useful!! A valuable well compiled guide for me and my field data collection associates. This is a valuable resource for result oriented programmes assessment. Thanks for this very concise notes on FGD. A very useful and needed artcle. Consists of every aspect of an FGD. Thanks for the write up.its of much benefit to me. What about the key indepth interview can anything be written on it. Thanks for another great, concise guide! I would argue that FGDs should not always be held in a private space, particularly for sensitive discussions. While it is often very difficult to find private locations to conduct qualitative interviews, FGDs that cover sensitive topics require a safe environment for participants; privacy is often integral to safety! As best practice, the location and make-up of the FGD should be contextualized to local social, gender, and power dynamics! Correction *Should not always be held in a PUBLIC space! – The technique fits perfectly well for educated and elite groups. However, with illiterate and vulnerable people, it has several disadvantages such as their fear to speak up openly, shyness, etc. – We do not go for a FGD with a list of well-prepared questions. You should have some broad areas noted down to probe on. In a FGD setting, one moves to several questions following a trigger! hello! I am currently doing my thesis and I am using FGD. My guide questions were formulated by me with the aid of my panel and adviser. However, I don’t know what validation test and reliability procedures to do for my guide questions. Thank you in advance for your response. Well, we should be able to differentiate between focused group discussion and group interview,…. I think, the example of questions provided here looks like more relevant for a group interview than an FGD,…. Thanks very much for your fruitfull presentation. Valuable information indeed. Thanks for kind sharing. Very precise and comprehensive write-up. please keep up with the good work you are doing. May you send me some articles/Books on Research Methods and qualitative data collection tools (eg Key Informants Interviews and Field Observations). I will be grateful if you can help. Thanks a lot for the short but productive and relevant note of FGDs. Hi Billow, thanks for the message. Unfortunately, we currently don’t have any other resources on qualitative data collection. But we’re working on developing them shortly! We’ll have a few blog posts out, possibly followed by larger guides and resources. If you want, you can subscribe to our newsletters to keep up our resources: http://soco.ps/1RfCoDb. Very precise and comprehensive write up. It helped me so much. Thanks a lot. May you send me extra documents on research methods and qualitative data collection tools through [email protected]. I will be grateful if you can help. Thanks a lot for this very useful article. Very concise information on FGD, thanks a lot!